Florida – September 7, 2018 – A big congrats to all the student and teachers who helped raise our state’s K-12 achievement ranking. And a big thank you to all the public charter schools in Florida for helping raise our state’s ranking. “Charter school leaders and board members’ drive to innovate and their commitment to raising student achievement, closing the achievement gap, and lifting graduation rates has absolutely contributed to our state’s academic ranking,” said Lynn Norman-Teck, Executive Director, FCSA. Public charter schools have been a vital part of Florida’s K12 system of public education since 1996 — and have continually help improve student performance while providing parents with quality school options. Using 2015-2016 student assessment data, the Florida Department of Education developed a report entitled Student Achievement in Florida’s Charter Schools: A Comparison of the Performance of Charter School Students with Traditional Public School Students. The comparative analysis of the academic achievement of students attending charter schools versus students attending district-run public school show that charter school students are making higher gains in various measured areas. The percentage of students making learning gains was higher in charter schools in 82 of the 96 comparisons, and in 22 separate comparisons, the achievement gap was lower for charter school students in 20 of the comparisons. 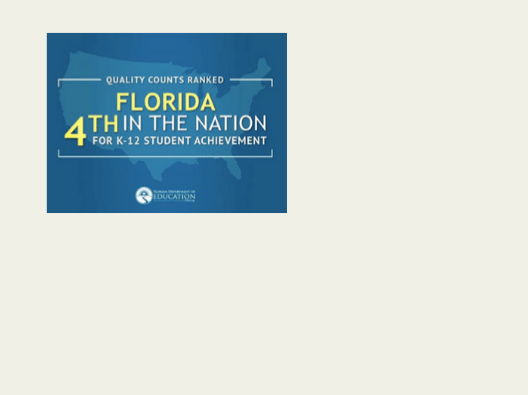 Florida’s overall rank for the K-12 Achievement category increased from 11 to 4. Florida outperformed the nation in every measure of achievement gains, poverty gap and Advanced Placement – 14 of the 18 achievement measures overall. Florida is ranked 2nd for improvement in both grade 4 reading and mathematics. Florida is ranked 3rd for improvement in grade 8 reading. More about the Quality Counts raking here. Read the Press Release from the Florida Department of Education.